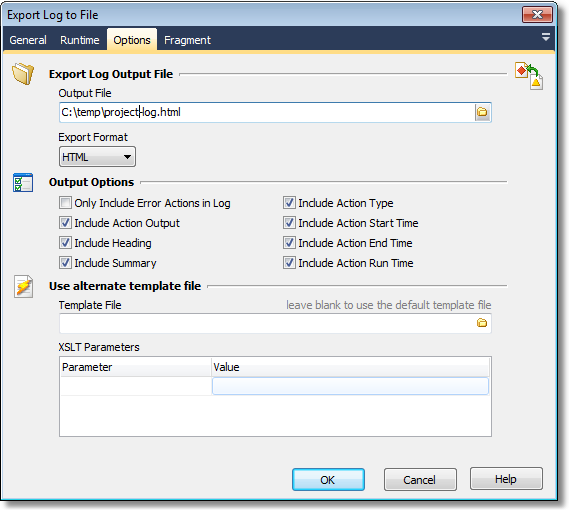 The Export Log Action exports a FinalBuilder run to a text based log file. This enables the log to be archived, sent as an attachment via email, further processed, etc. You can choose to export the current log, in Text, HTML or XML formats. Include Summary - check this option to include a summary in the output (not applicable for XML format). Include Action Type - check this option to include the action name in the output (not applicable for XML format). Include Action Start Time - check this option to include the action start time in the output (not applicable for XML format). Include Action End Time - check this option to include the action start time in the output (not applicable for XML format). Include Action Run Time - check this option to include the action run time in the output (not applicable for XML format). Template File - You can also specify a different XSL Stylesheet template file to alter the output format of the log file. When you leave Template File blank, FinalBuilder will choose the appropriate stylesheet depending on the Export Format chosen (see Export Format above). The "XSLT Parameters" allow you to pass variables to your XSL Stylesheet. Note that the default options for the log can be set in the FinalBuilder options dialog. You may wish to only export a section of the log, eg. the log of a particular Action List, or even just the log of a certain action. Export entire log - selecting this will export the entire log (up to when this action runs). 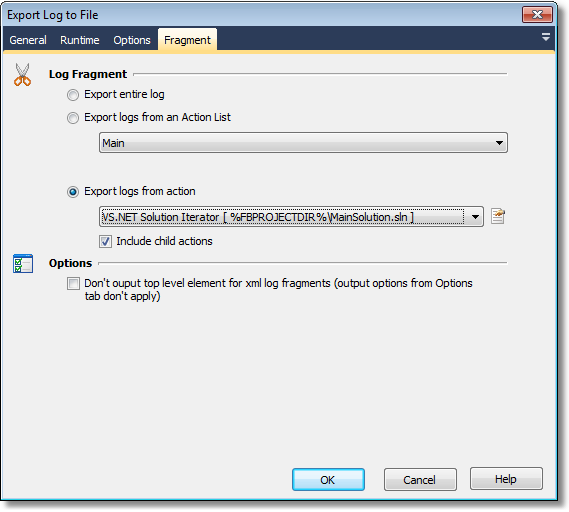 Export logs from an Action List - choose this option to export the logs of a particular Action List. Select the action list to export. Export logs from action - choose this option to export the logs of a particular Action, and then choose the action to export. Actions are listed by description in alphabetical order. If you have two actions with the same name, then they will both be listed (and if you need to choose one, then we recommend you rename them so you can tell them apart). Include child actions - choose this option to include in the logs any child actions of the action chosen. This option will not export the logs of any Action List run as a child action. Note: for both exporting of a particular Action List and Actions, if that action or action list is run more than once, then all occurrences will will be exported to the log.